256 pages | 18 B/W Illus. • How do good governance principles translate into local settings? • How do local settings influence the conception of what is good governance and how the debate over good governance is deployed as a political or administrative strategy? 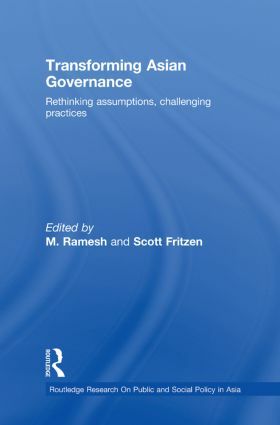 Using case studies in governance from Thailand, the Philippines, Pakistan, Malaysia, India, Indonesia, Korea and Japan, this book will be essential reading for anyone interested in the public and social policy of Asia, and international and comparative governance more generally. Scott Fritzen is Assistant Professor in the Lee Kuan Yew School of Public Policy at the National University of Singapore. M Ramesh is Associate Professor in the Lee Kuan Yew School of Public Policy at the National University of Singapore. The Routledge Research on Public and Social Policy in Asia Series publishes quality manuscripts on contemporary public policy issues by scholars in Public Administration, Public Management, and Public Policy as well as Economics, Geography, Political Science, Social Work, and Sociology. There are no limitations regarding policy sectors that may be included in the Series, provided the manuscript deals with significant public policy issues with broad appeal. The Series is advised by an international Editorial Board and edited by M Ramesh of the University of Hong Kong.